"Upon first hearing that INDEPENCENCE, The True Story of Dr. Mary Walker would be a one-woman show, I was very interested to see how it would play out. I quickly realized why only one actress was cast for this production. Throughout her life, Dr. Mary Walker was an extremely independent and strong woman who never relied on anyone but herself for her success. Why would there need to be another person to tell her story besides one incredible woman? Hearing the amazing story of Dr. Walker’s life and all of the hardships that she endured was unbelievably inspiring. I was shocked that I had never heard of the only woman to ever receive the Medal of Honor, but I was grateful for the play bringing me knowledge of her. Equally informative and entertaining, Kathie Barnes did an incredible job of bringing Lloyd Schwartz’s words to life. Together, they provided the recognition that Dr. Walker deserves through this wonderful tribute to her. I definitely think that this is a production that all people should see to help spread the word of this astounding woman, as well hopefully inspire more untold stories of the history of women to be told." "During my many years of working on finishing my degree in Women’s and Gender Studies, I was always fascinated when I learned about the many amazing accomplishments of women and wondered why not only had I not heard of them, but neither had the students I was in class with! This ignited my interest in the First Wave of feminism and I wanted to know more. After all, this is the wave that made the Second Wave, Third Wave, etc. possible. I admire Elizabeth Cady Stanton, Susan B. Anthony and the many others who sacrificed so much, worked tirelessly and marched before us, enabling woman to gain the right to vote. I finally took my dream trip to Seneca Falls, New York, the birthplace of the woman’s movement and was pleasantly surprised at all I was able to enjoy and learn more about! This was during Convention Days Celebration, what a wonderful weekend of events. So much HERSTORY! It was then and there that I had the privilege to meet some amazing people who yearned to tell more women’s stories, and see the play about DR. MARY WALKER, who I had never heard of. What a double treat to see the play in the very location that ALICE PAUL called for the ERA (Equal Rights Amendment) in 1923! I couldn’t wait for the play to end because I wanted to stand up and cheer on the amazing actress and playwright for bringing DR MARY WALKER’S story to us. I always wonder in my heart how different it would have been for many if we could have grown up with role models like DR. MARY WALKER, because there are numerous women who we should have learned about. Kathie Barnes is a truly lovely and amazing woman and talented actress, and we instantly bonded as we discovered what women’s history enthusiast we are. We talked about and made plans to bring the play to Richardson Auditorium, at Princeton University and I am proud to say we did on April 11, 2018. The play was very well received! Many audience members like me were happy to know about DR. MARY WALKER, and also pondered why we had never heard her. Thankfully, times are changing and more and more WOMEN’S HERSTORY is being told. Stay tuned for more!" "INDEPENDENCE tells the inspiring story of Dr. Mary Walker that sets an example of what we can achieve, if we follow our passion and beliefs. Ahead of her time, she stood up for the rights of woman and equality in the work place, connecting to many issues that we still face in the modern working world. The one-woman play portrays the story in a fascinating and very personal way that will make me remember Dr. Mary Walker and her remarkable life." 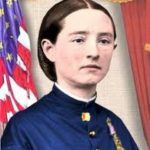 "I hadn't heard of Dr. Mary Walker prior to this show! And I am stunned that she is not in history books. I am not usually a fan of history or of one person show, but this show was so well done and Kathie Barnes was such an Amazing Actress in the role that I was thoroughly engaged. I recommend that many people, men and women, see this amazing show!"